Last year I wrote a critical article about the government’s new Work and Health Programme, I flagged up concerns regarding government plans to enlist GPs in prescribing work coaches for people who are sick and disabled, and in providing advice on job-seeking. The private and confidential patient-doctor relationship ought to be about addressing medical health problems, and supporting people who are ill, not about creating yet another space for an over extension of the coercive arm of the state to “help people into work”, regardless of whether or not they are actually well enough to cope with working. I also posted my article on the Pulse site for medical professionals last October, raising some of my concerns. I proposed that the government may use the “intervention” as a further opportunity for sanctioning sick and disabled people for “non-compliance”, and I expressed concern that this would conflict with the ethics and role of a doctor. I also stated my concern about the potential this pilot has for damaging the trust between doctors and their patients. I do support the idea of social prescribing in theory, but this scheme is certainly not that. This is plain state harassment and coercion. It’s interesting to see that among all those listed present at the various pilot-related meetings behind closed doors regarding the government’s new Work and Health programme, there isn’t a single sick and disabled person or relevant representative charity to be found. That’s telling, because it means that the provision is not founded on consultation, is not designed to be inclusive from the start, nor does it have a democratic or representative foundation. It’s another case of government policy that acts upon groups people, prescriptively, as if they were objects, rather than human subjects with identifiable needs and the capacity for democratic dialogue. Part of the reason for this renewed government attack on sick and disabled people is that the Government’s flagship fit note scheme, which replaced sick notes five years ago in the hope it would see GPs sending thousands more employees back to work to reduce sickness-related absence, despite GPs having expressed doubts since before its launch, has predictably failed. The government plans to merge health and employment services, and are now attempting to redefine work as a clinical outcome. 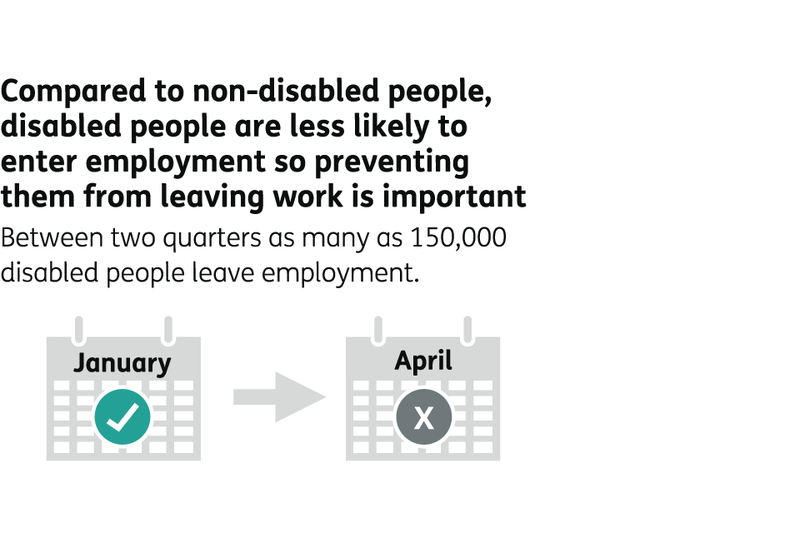 Unemployment has been stigmatised and politically redefined as a psychological disorder, the government claims somewhat incoherently that the “cure” for unemployment due to illness and disability, and sickness absence from work, is work. This is the kind of mentality that the new Work and Health programme is founded on: Dr Josephine Sauvage, the joint vice chair of NHS Islington CCG and a GP at City Road Medical Practice, where the programme is being trialed currently, said the programme can help patients. A person receiving medical care or medical treatment. A person under a physician’s care for a particular disease or condition. There is no mention of a person’s employment status or the pressing need for a job prescription in that definition. As part of the Work and Health programme, beginning next month, the DWP plans to access people’s medical information. Employment coaches will be able to directly “update” a patient’s medical record. GPs will have to inform patients of the access to information and any extraction of confidential information from their medical files, but cannot withhold information unless their patient explicitly objects. Patients have the right to object to the use and disclosure of confidential information that isn’t used for their medical care. Patients can explicitly refuse their consent to data sharing. The Data Protection Act 1998 covers personal information including health records. Further provision under Article 8 of the Human Rights Act 1998 establishes a right to respect for private and family life. This underscores the duty to protect the privacy of individuals and preserve the confidentiality of their health records. request the secondary uses opt-out form from your surgery called the 9Nu0. Request that 9Nu0 code is added to your GP records. Remember to include your full name, DOB and other details. In addition to sharing information with the DWP, due to changes in legislation, your GP can now be required to upload personal and identifiable information from the medical record of every patient in England to central servers at the Health and Social Care Information Centre (HSCIC). Once this information leaves your GP practice, your doctor will no longer be in control of what data is passed on or to whom. This information will include diagnoses, investigations, treatments and referrals as well as other things you may have shared with your doctor including your weight, alcohol consumption, smoking and family history. Each piece of information will be identifiable as it will be uploaded with your NHS number, date of birth, post code, gender and ethnicity. NHS England – the body now in charge of commissioning primary care services across England – will manage and use the information extracted by HSCIC for a range of purposes, none of which are to do with your direct medical care. Whenever I am ill, I don’t ever consider consulting Iain Duncan Smith or the government more generally for advice. There are very good reasons for this. I don’t want to be confronted with pseudoscientific Conservative anti-welfare dogma, I prefer instead to seek the expert, trusted medical opinion of a qualified doctor. I expect professional medical care, not brute state coercion and a punishment regime that is particularly reminiscent of the 1834 Poor Law amendment Act. And despite assurances from those professionals currently trialing the Work and Health programme that all participation is (currently) voluntary, against the current backdrop of ever-increasing welfare conditionality, the political stigmatisation of people not in work, the frequent punitive deployment of benefit sanctions, the mandatory welfare-to-work schemes, it’s difficult to imagine a Conservative scheme that will not entail exercising Conservative prejudice and pseudoscientific justifications of Tory economic Darwinist ideology. It’s hardly the case that the state has an even remotely credible track record of assessing people’s medical conditions, nor is it the case that this government bothers itself with empirical evidence, or deigns to listen to concerns raised by citizens, academics, professionals and charities regarding the harm that their policies are causing. This is a government that can’t even manage to observe basic human rights, let alone care about citizen’s best interests, health and wellbeing. It’s not possible to make people who are ill better by punishing them, in just the same way as state coercion and using prejudiced language doesn’t “cure” poverty. I don’t need more quack medicine on top of the current heavy doses of Conservative big state psychopolitics, traditional prejudices and subsequent quacking, slapstick psychobabble. It’s bad enough that Jeremy Hunt thinks he’s the all singing homeopathic Minister for magic and that Iain Duncan Smith thinks he can miraculously cure sick and disabled people by simply forcing them to work. The side-effects of five years of the Conservative’s ontologically insecure rhetoric, that’s been largely ranting, repetitive, incoherent monologue, are nauseating enough. Nobody should need to say any of this in 2016, but tragically, we seem to have a government that hasn’t yet escaped the feudal era. Or playing with their alchemy sets. I’m in full agreement with Boycott Workfare, the Mental Health Resistance Network, and Disabled People Against the Cuts. I shared my original article with two of those groups and I’m pleased that they have since organised a protest for March 4, 3pm at the City Road Surgery, 190-196 City Road, London EC1V 2QH to raise public awareness of the issues and implications outlined. I just wish I was currently well enough to get to the protest. They say: GP surgeries are for medical treatment, the job centre is for “employment coaching” and job-hunting. And governments in first-world liberal democracies are for creating policies that actually meet public needs, rather than imposing totalitarian control, manipulating and micromanaging citizens to meet government needs and political outcomes. I am so scared. This is appalling. Thank you for your advice on which forms and letters to use. I shall be sharing the advice on fb. I’ve just adopted a little dog as a commitment to staying alive for a few more years, but every time I read about the government’s policies it makes me feel so trapped and unvalued that suicide seems the only way out. Well said Kitty, Great article. Wish I could adopt a dog but so afraid the DWP will find a way to force me into their chain gang. Then the dog could end up spending most of its time alone. I live alone and a faithful friend would really improve my quality of life. Also afraid I couldn’t afford the vet bills etc. A few years ago I would have been nearing retirement so a dog would have been just the ticket. A friend to care for in my old age. I have had dogs all my life up till now, the time I could most benefit from one. What a bazaar world this Government is creating. Topsy Tervy and insanely disturbing. You might find a local dog rescue who can place a dog with you for foster care, where the costs are fully covered. Or you could join the Cinnamon charity, where you can help a person who cannot provide full care for their pet, so you provide walking and companionship for the dog. Thank you for this information. I’m like Tracy, every time I see a new government policy it makes me feel sick….almost as bad as seeing the dreaded brown envelope on the mat….I just hope that this doesn’t come to pass. Me too. I’m hoping most GPs don’t agree to be a part of this. It certainly conflicts with their hippocratic oath and ethical framework. Living with the fear of constant reassessment is terrible. I realised a hell of a long time ago that NHS GPs do not swear the Hippocratic Oath. The majority don’t. Some happen to. There is no obligation to. NHS GPs are incompetent as almighty f**k. Or I have a bad mark against my name and there is no reason for me to have one. Liars who haven’t sworn the Hippocratic Oath, would operate like this. Ones who’d sworn the oath (and DECIDED to live up to it, which can’t always be a given…) would not. They would literally be omitting to act on behalf of their patient. I can’t imagine the lies the NHS muppets must be telling themselves if they think they follow the H.O.’s “omission of action” clause. They utterly don’t live up to it! Not even within expected NHS budgets and operational parameters. So why not? They could act to hurt the government and do their bit politically. The voting booth isn’t working (gerrymandering, First-Past-The-Post system etc). I thought I had already opted out of having my medical records shared with anyone. How many times do we have to do this? Already I feel cautious about what I say to my doctor. A little bit of that trust has already gone. The GP was the person who was on your side. Perhaps the DWP could sort out employee support in government departments first. My government employer failed to put any of the things in place for me that its own occupational health department had recommended. I was left with no alternative but to stay off sick and eventually resign from my job. What hypocrites they all are. Absolutely, as you say, employers are not making reasonable adjustments for employees – and that’s a legal requirement. I’d check to see if your opt-out of medical data sharing applies to the DWP, just in case. Thank you for a brilliant informative but highly disturbing article. I have tucked the links away for future reference as being a disabled lady i’m sure i will need them at some point. Maybe changing the “sick” note to “fit” note had failed as simply changing the name does not actually change the fact that the person receiving these are not fit for work, and in some cases maybe chronically sick or disabled. As the article says “state harassment” … , but then the chronically sick and disabled get this on an almost daily basis from the cruel heartless government. I could go on and on, but many of my dear fiends can fill in the spaces with their own dreadful stories of persecution, bullying and harassment. The conservatives clearly can’t accept their ideology isn’t an accurate portrayal of how the world and others actually ARE. They refuse to accept reality, empirical evidence and seem hellbent on re-writing everything from history to people’s every day experiences of being ill. Manipulating the world into conformity to suit their own purposes. We usually call people like that “psychopaths”. I believe in the case of (e.g.) BPD people, they call it ‘Crazy-Making Behaviour’. The government is making people crazy by gaslighting them, in effect. For some reason although I follow your blog I’ve not received it today and can’t to it via a comment on Twitter; don’t know what’s happened, do you?! Oh, ok; I don’t do Facebook so it comes to me via an email notification, but today I got it via a comment on twitter (excuse stupid mistake in other message!). As if it isn’t bad enough that this government is forcing sick and disabled people into work, now we have this creeping authoritarianism as well. No doubt the DWP will trawl through these medical records for anything that might support further action on their part. Might I also suggest that anyone submitting the opt-out letter requests confirmation that this fact has been added to their medical records. Some years ago a friend of mine was disappointed to find that no action had been taken on a similar request. Please read this if you value doctor patient privilege, if you don’t the whole world and his uncle will be able to access personal information, one way or another. Kitty Sue advises and offers helpful links to opt-out documents to make things easy. Long post – sorry! Please read all the way down. Every day since this Government was elected I have been outraged again by yet another infringement of my human rights. My political leanings were very slightly to the left of centre (or what used to be the centre) for many years, but since last year, I have become more and more left wing. (Or “socialist”, in the true meaning of the word) I have been on disability benefits for many years, since the date I was invalided out of the RAF because I was diagnosed with severe bipolar disorder, PTSD, hearing loss and osteoarthritis. The MOD assesses me as 80% disabled. The DWP now says that having to live with a “severe and enduring mental illness” no longer places me in the “vulnerable” category as far as claiming DLA and ESA is concerned. I have enough of a battle with the DWP to claim any money at all, and my psychiatrist and GP have been extremely supportive in writing reports that back up my claims. If I can no longer be sure that my medical professionals will keep my private consultations with them confidential, how can I possibly remain honest when I speak to them?? If all my private medical records are going to be uploaded – by law – to a data base outside the control of my own medical professionals, who will I be able to turn to in order to ensure that anything I say IN CONFIDENCE will remain private? I have been posting about this on Facebook ever since I discovered it; and I have already written to my GP telling her to put the correct flags on my records so that nothing about me goes beyond the surgery’s walls. I have checked, and it has been done. “You can, also, opt-out using the 9Nu4 code – this will ensure that NO CLEARLY IDENTIFIABLE DATA WHATSOEVER IS RELEASED OR SOLD BY HSCIC, FROM ANY INFORMATION THAT IT HOLDS ABOUT YOU. The 9Nu0 opt-out code would ensure that NO DATA WHATSOEVER IS UPLOADED TO THE HSCIC FROM YOUR GP RECORD, AND SO NO INFORMATION FROM YOUR GP RECORD CAN BE RELEASED BY THE HSCIC – TO ANY SUCH ORGANISATION. Your expriences are a disgraceful indictment of a system that does not support people who are sick and doing all they can to support their own recovery and survive – meeting basic needs such as for food, fuel and shelter. The DWP put you and your wife’s wellbeing and health in further jeopardy. I wish I could say this was a mistake, a rare experience that is down to human error at their end, but it isn’t. The system is set up to intentionally remove the sick role, recovery time, and as you so importantly point out, if this goes wrong and someone is injured or their health deteriorates as a consequence, or if someone dies as a result – and that may also include other people who are placed at risk because someone has been coerced to work when they are not well enough to do so – noone is willing to take responsibility. The DWP are willing enough to take people’s benefits away on the prextext that they can work, when it becomes clear they cannot, the DWP refuses to accept the responsibility for their own decision and the consequences. It needs to change. The system is barbaric and all about saving this government money to handout to the wealthy. PLEASE GOD – FORGIVE THEM? May I please refer you to the attached letter, from Dr. H. Sharafzadeh, dated the 7th December, 2016, where he states? I see the notes from 27th June, when my colleague Mr. Nissar performed a DRE and he confirmed also that he had diarrhoea at that time. This is the same condition I reported to Tony Townsend, the Disability Employment Advisor of Boston Job Centre, with Louise Stocks, Occupational Therapist of Pilgrim Hospital in attendance, during the months of December, 2015 and January, 2016 – before the Medical Assessment of the 27th February, 2016. The same condition I reported to Dr. Ranjan Chowdhary, (GMC Licence 3632255), where I confirmed I was “dirty” most days and reported again, whilst I was in the office of Boston’s Citizens Advice Bureau, on the 31st March, 2016, taking the Mandatory Reconsideration. (Witness “Vicki” – I think). Further reports were made to the Department for Work and Pensions on the 19th April, 2016, for which I hold an audio CD and statements were made; what do I need to do – take photographs; I can’t help my body; this man, ( Dr. Chowdhary), told lies – I stopped my medication April / May 2015; I have no history of depression. This kind person realised the seriousness of the situation and advised me to appeal and appreciated I needed to be placed within the support group. Extract of letter to Natalie Vickers of the C.H.D.A dated 16th July, 2016. Asked about my typical day, I answered “It starts with me waking-up dirty, so first thing I have a shower, dress then come down stairs to do some work, with my lap-top. Whilst sitting at the table I have moments of urgency of needing the toilet, sometimes I make it, sometimes I do not “!! Further into the assessment he asked did the medication work, to which I replied, I still have bowel incontinence. At this stage, I sat back in my chair when he said “DONT MENTION THE INCONTINENCE AGAIN, WE’VE DEALT WITH THAT MATTER”! I then realised he was answering his own questions and he could have written the report without me. He certainly did not take any notice of Dr.Mangions’s remarks, when he said “long standing diarrhoea with episodes of faecal incontinence” nor the statements made within my NHS History explaining I have problems since 2012. I appreciate this is a case of “he said, I said” and maybe I have not quoted word-for-word. In short, he glossed-over my bowel problems by saying “investigations indicate I.B.S for which he takes medication regularly”. This last declaration is incorrect on both accounts: Investigations for I.B.S. stopped prior to July, 2014 and the “Mebeverine” soon after January, 2015. This can be confirmed within the pages supplied by the Upper Tribunal – Pages 216 and 217 – letter dated 14th October, 2016, to the HM Courts & Tribunals Service, Birmingham from Dr.S.K.Jain – Consultant Physician / Gastroenterologist, Pilgrim Hospital. Vision Impairment pages 12 & 20 of the Upper Tribunal papers – surrender of driving licence, early 2012 – answered with Certificate of Partially Sighted – Pages 342 to 345. Lack of Energy ( page 21) – sleep 10 hours and still need two hours in afternoon; fifteen minutes work and need one hours rest – answered by the letter from Liz Ford of the Stroke Association, dated 14th July, 2016 – Page 200. Stress ( Page 26 ) – Dr. Mangion advised me before my stroke of the 8th November, 2011 to avoid stressful situations – answered with pages 1 to 348 ! I have no history of depression, so no remarks were made within the ESA50 Form, nor at the Medical Assessment of the 27th February, 2016. TO SELL MY HOME AND MOVE NEARER MY SONS. I am somewhat surprised the Secretary of State requires further findings regarding this case – taking into account those supplied by the Upper Tribunal on Pages 216 & 217. May I also request – Dr.Ranjan Chowdhary is held in attendance, along with any representative from the Department for Work & Pensions and/or the office of Mr.Matt Warman, MP. Your prompt reply would be appreciated. There are many Medical Locum Agencies in UK which provide GP jobs whthout any agency fees.